The Secret Recipe Club strikes again, as it does every last Monday of the month. Each participating food blogger gets assigned a blog in secret, and must publish a post about a chosen recipe from the assignment at the exact same time as everyone else in the group. This month I hit gold. Pure gold. My blog was Fried Ice and Donut Holes, hosted by Melissa. A special assignment not only because it is one amazing blog, but because a little bird told me that this month marks her last participation with our club. That is sad, of course, but sometimes we need to make choices and set new priorities. When I read Melissa’s About Me page, I kept smiling all the way through it. For one thing, this whole paragraph could be equally applied to me! Though I absolutely love my job, cooking and baking are my passions. During the summer of 2009, I started reading some food blogs and finally, my husband suggested that I start my own. As a result, I began Fried Ice and Donut Holes in July of 2009 as a hobby and online recipe box, so to speak, for us to keep track of the many great recipes that we try. When I was younger, I remember my grandpa always telling us to behave or we’d be having fried ice and donut holes (aka nothing) for dinner. For some reason, that phrase stuck and now it lives on forever! Isn’t that super cute? Melissa started her blog almost at the same time I started mine (6 long years ago), and in another coincidence, she joined The Secret Recipe Club at the same time I did, as well as other old timers such as Dorothy, from Shockingly Delicious. It is sad to see her go… She received my blog as her monthly assignment not too long ago and composed a great post about my French Style Rolls, if you’d like to see it, click here. As you can imagine, someone who’s been blogging for so long will have a ton of great recipes, and it was not easy to pick one to feature today. Just to tease you with some of those in my final list of possibilities: Tomato Ricotta and Prosciutto Tart, Sriracha Turkey Meatballs (my love for the spicy sauce is hard to ignore…), Eggplant Cannelloni, Bacon & Spinach Souffle, Roasted Cauliflower Risotto (oh, my…), Pretzel Rolls, Baked Coconut Shrimp, Chocolate Chip Cookie Dough Truffles (yessssss! 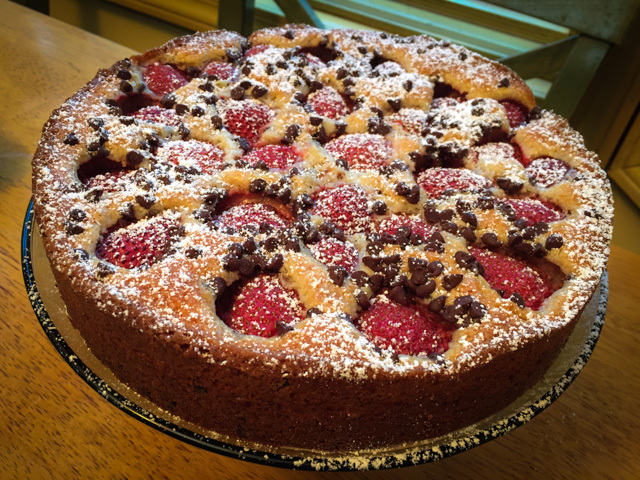 )… But in the end I went with her adorable Strawberry Chocolate Chip Cake, which was fun to make and a pleasure to eat! Line the bottom of a 9-inch round springform pan with parchment paper and grease the sides of the pan with butter or cooking spray. In a large bowl, mix together the flour, baking powder, and salt. In the bowl of a stand mixer, combine the butter, yogurt, and sugar and mix on medium-high speed until light and fluffy, no more than 2 minutes. Reduce the speed to medium and mix in the egg, beating until light and fluffy. Then add the milk and vanilla. Reduce the speed to low and gradually add the flour mixture, mixing just until incorporated. Fold in the chocolate chips. Pour the batter into the prepared pan. Arrange the strawberries on top of the cake, cut sides down and close together. Sprinkle additional chocolate chips between the berries. Bake at 350 degrees for about 1 hour, or until the top of the cake is golden brown and a toothpick inserted into the center comes out clean. Remove the cake from the oven and cool for about 40 minutes before releasing it from the pan. Dust the top with powdered sugar, if you want. Comments: My only modification of the recipe was to use mini-choc chips because that’s what I had in the pantry and I thought they would work well too. The cake is absolutely delicious, made our graduate students happy during one of our early meetings, and the small amount leftover was shared with colleagues from the department. Huge baking success! Since this is the last participation of Melissa in our club, I decided to make an additional recipe from her site as a special farewell. A recipe that I’ve always found pretty intriguing, but stayed as a culinary project for years. Not anymore. I made a small batch of shakshuka for our Saturday lunch. Have you heard of it? 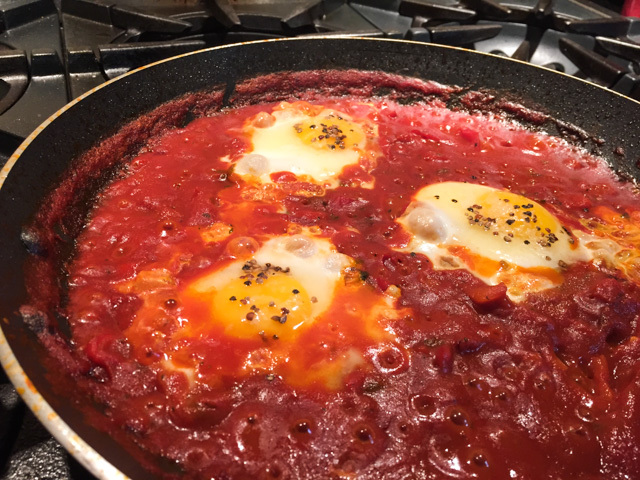 A flavorful tomato and pepper based sauce that is used as a base to gently cook eggs. So, so good! In a very large sauté pan, heat the oil over medium-high heat until shimmering. Add the shallot and cumin and sauté for 5 minutes. Add the peppers, brown sugar, and herbs and continue to cook for 10-15 minutes to develop color. Add the tomatoes, saffron, cayenne, salt, and pepper. Reduce teat to low and cook for 15 minutes, adding water 1/4 cup at a time, so that the mix has the consistency of thick pasta sauce. Taste and adjust seasoning so that the mix is potent and flavorful. I am so glad I made this bonus recipe from her site! I’ve always been intrigued by Shakshuka, had quite a few versions of this recipe saved “to make soon”, but finally this assignment with The Secret Recipe Club gave me the chance to go for it. It is a perfect dish for a brunch, or light lunch. It’s important to not over-cook the egg yolks, you want to have the yolk liquid so that it mixes with the very flavorful tomato sauce, with intense saffron flavor. A crusty bread to soak the sauce is a must! Melissa, I hope your last assignment with the club gave you as much pleasure as I had cooking from your site! I wish you good luck on all your future projects! To my readers, please stop by Melissa’s site to say hello, and if you want to see what my fellow club members shared this month, click on the blue amphibian smiling at you at the bottom of this post. Oh my two great recipes in one post! That strawberry cake looks so elegant yet perfect. The studs of chocolate chip are a great surprise for a summer cake. I think the choc chips really make this cake super special… and cute! Thanks, Karen! Glad you enjoyed my choices…. That cake is beautiful but the savory Shakshuka really caught my attention. Thanks for sharing two great SRC picks this month. Nice to see you here, Wendy! HOpe you had a great REveal Monday! That cake looks divine! I will definitely be trying it out! Thanks for sharing! I hope you try it, such a delightful cake! Two wonderful recipes!! Best Wishes to Melissa! And Happy Reveal Day to you!! What a lovely tribute to Melissa’s blog – such a great SRC sendoff. And how amazing does that cake look? Oh my goodness, my mouth is actually watering! And the shakshuka looks awesome, too. Great job by you this month for the SRC! THanks, Amy! I had a total blast with this month’s assignment, so glad I got her blog in her last participation…. WOnderful that you enjoyed the post! That makes me very happy! Best wishes for you…. and please come back when things settle…. This looks so good! I could see even subbing the strawberries out for other fruits once it’s out of season. I am drooling and may have to make this on a rainy day. That’s just about the nicest send off ever Sally! How cool that you did both of these recipes and were true to Melissa’s blog. She is so lucky to have you as her final SRC stalker!! I must try both of these!! Thanks so much, Karen! Very sweet of you…. The cake looks droolworthy! The shakshuka is always delicious, in my book. I’ve made a few version of it. Great picks this month! 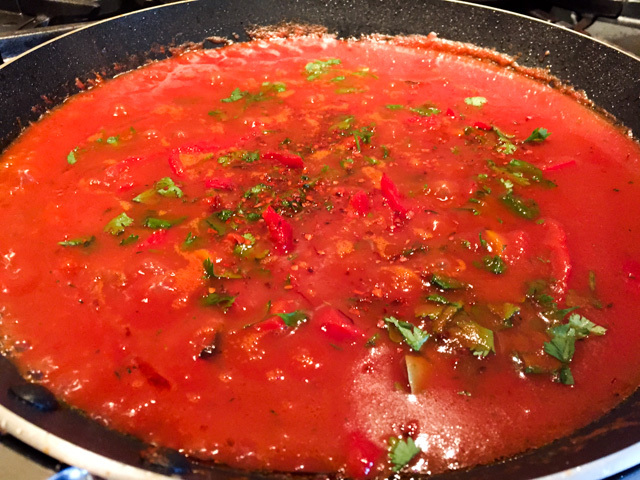 I think I might have cooked the sauce down a tad too much, but it is a very forgiving recipe – must make it again soon…. A very beautiful tribute. That cake looks stunning, and your bonus shakshuka sounds delicious. I love, love, LOVE Shakshuka. It’s one of my fave dishes. It’s now one of those dishes I make over and over and over again and every time I make it it gets better. I’ll try your recipe next time! Make sure you get the saffron going…. it really gave this dish amazing flavor! Have a nice trip, Mike! I LOVE shakshuka as well! Also berries and chocolate-you can’t go wrong. Agree! I think actually that a serving of shakshuka followed by a slice of this cake keeps happiness at a great level! Aww you had a lot of goodies to choose from!! Love that you went sweet and savory. That cake looks absolutely summer perfect, and I will never pass down a plate of shakshouka! 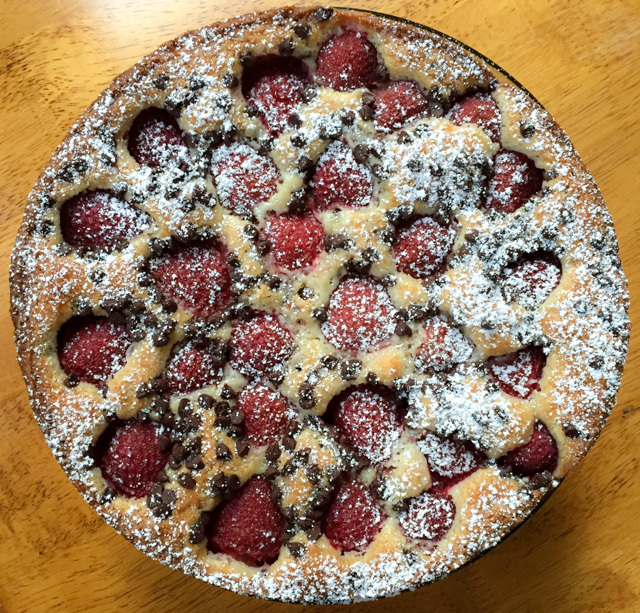 I almost made two recipes from my chosen blog this month too! Such great recipes. It is amazing what blogging can bring to our lives, isn’t it? The connections, the discussions ‘behind the curtains” – it’s the unexpected, untold joy of blogging…. That cake. Wow, just wow. I must make that. 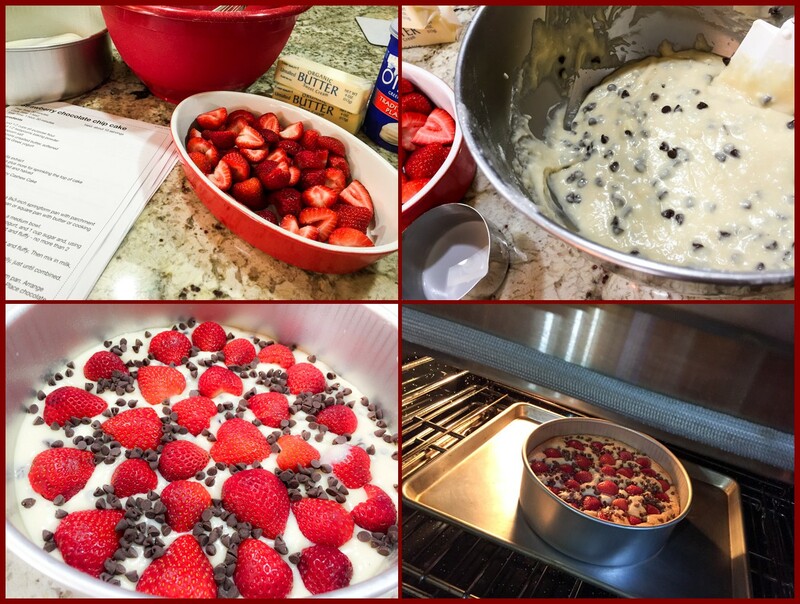 Love the combo of strawberries and chocolate chips. Love Shakshuka too! Two wonderful recipes. Best wishes Melissa.